Award winning audio engineering school Point Blank has launched an innovative online music mixer which allows you to produce your own tracks from a library of hundreds of professional loops and samples. It's completely free to use and you can choose from a range of styles including House, Hip-Hop, Electro, Drum 'n' Bass, R'n'B and Rock. Within minutes you will be mashing up beats, basslines, synths and even vocals to create your own unique mixes. 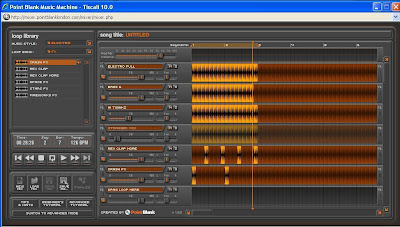 The Music Machine combines the key features of professional music software with a simple user interface and easy to use tutorials. Users can drag and drop hundreds of beats and samples, and automate looping, panning, volume and mute controls to control up to 16 tracks. You can save your mix and re-load it at a later date or, when you’re happy with your creation, finalize your track and publish it on the Point Blank website, so other users can listen and rate your skills. For beginners, it’s the perfect introduction to the world of creative music production. If you are an experienced music maker, then you’ll be mixing your next hit track in mere minutes. Just make sure your boss isn’t looking over your shoulder first! Great job guys.. gives people a taste of what they might be able to achieve with some serious study at Point Blank. Warden has already done some impressive analysis of this data at an aggregate level, and I know researchers would love to get their hands on it. And like the “Tastes, Ties, and Time” Facebook project, Warden wants to release the dataset to the academic community. Thank you for sharing the information and this is really a great thing as now not only audio engineers but, even common people would be able to produce different musical tracks online. There are number of audio engineering schools who are providing the service of audio engineering and while surfing on internet, I came across a site named as Pro tools training who is providing the service of expert pro tools certification in music. Snapchat is the best messenger app, today many people use this app for sharing the data like as images, information, videos, and docs files. if you have anytypes of issue that are related to the snapchat messenger so you can contact our Snapchat customer support team.